We spent 5 days hiking in the North Carolina portion of the Blue Ridge Mountains. Our home base was Little Switzerland, NC, which is around mile marker 303 on the Blue Ridge Pkwy and about an hour north east from Asheville, NC. In the 5 days we hiked in 3 general areas: Mt. Mitchell State Park, the area around Little Switzerland, and an area about 1 hour north east of Little Switzerland. We spent 1 day in Mt. Mitchell State Park and went on one of the best hikes of our lives! The entrance to Mt. 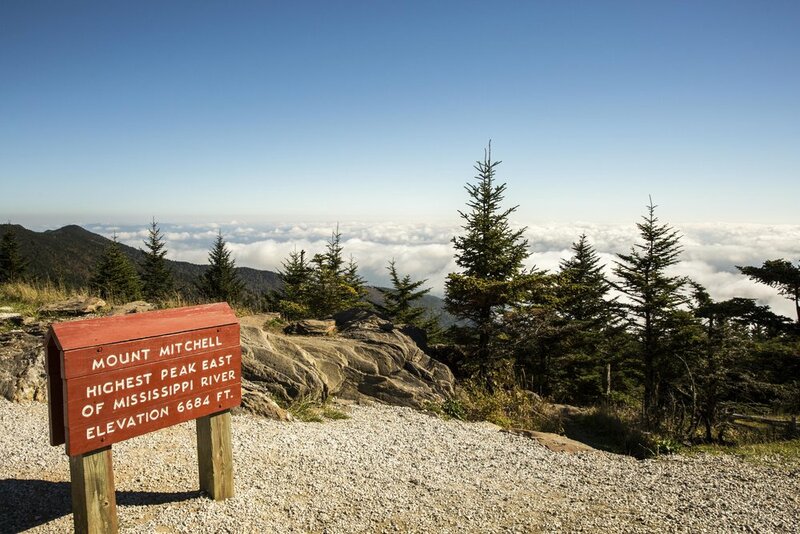 Mitchell State Park is around Blue Ridge Pkwy mile marker 355. 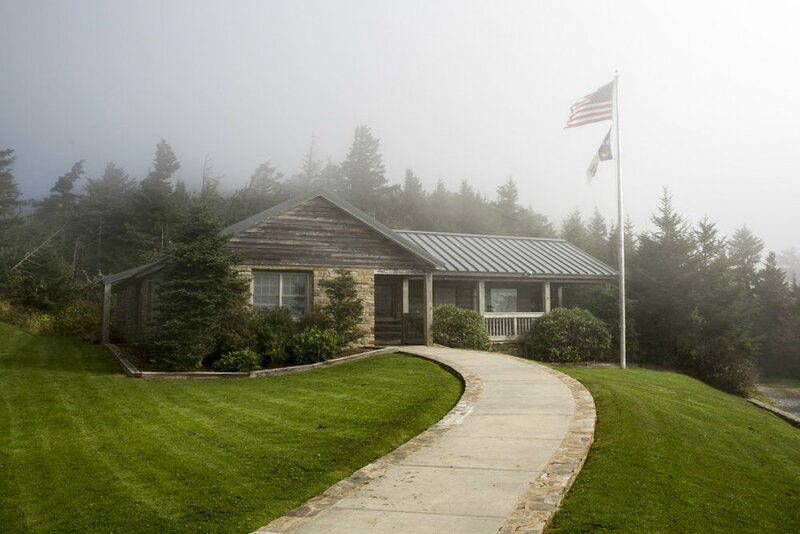 The visitor center is worth a stop… the staff is extremely helpful and helped us understand the hiking trails and develop a plan for the day. The trail to the crest of Mt. Mitchell starts at the visitor center. Instead of hiking to the crest of Mt. Mitchell we drove to the top, enjoyed the views, and hiked part of the Deep Gap trail, which leads to the crests of the neighboring mountains. We hiked about 3.5 miles to Deep Gap and turned around and hiked back to Mt. Mitchell (about 7 miles round trip). The Deep Gap trail meets the Black Mountain trail which continues and is popular for hikers who want to camp for the night. Another popular shorter option is to hike 1 mile to the Mt. Craig crest and hike back. The Deep Gap trail is rated moderate to difficult… lots of up and down, rocks to navigate, and ropes in a couple sections. 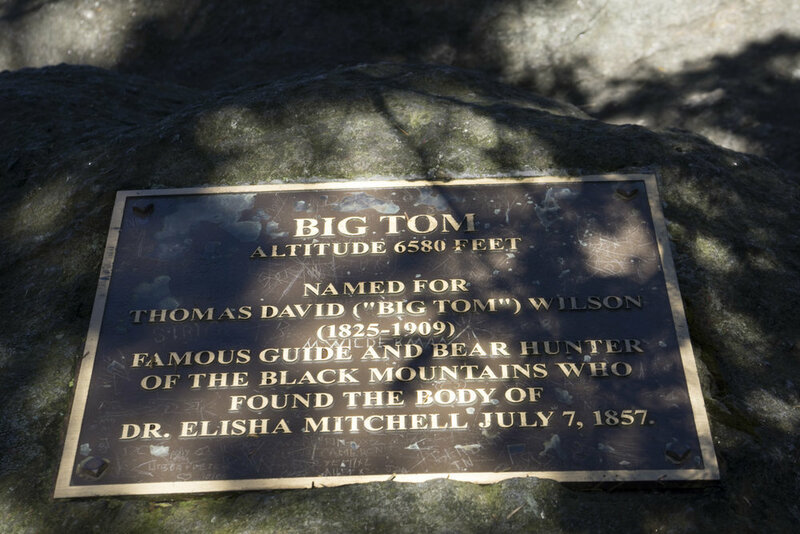 The most challenging section of the trail is the descent from Big Tom Spur/ascent to Big Tom Spur… it’s very vertical with rough terrain… the ropes are very helpful. Though there is a lot of up and down, at no point is it all up or all down for an extended period of time, which makes the trail very enjoyable… the experience changes frequently. We generally prefer loops so we don’t have to repeat scenery, however we didn’t mind repeating on the Deep Gap trail… the experiences are totally different ascenting and descenting each crest because there is so much terrain to navigate. We were on the trail for 4 hours 20 minutes, which included about 40 minutes of breaks. The trail is well marked throughout. There aren’t a ton of look-out points, as the trail is surrounded by beautiful forest. We hiked this trail during the week and had it mostly to ourselves once we got past the Mt. Craig crest… it was a real treat! The picnic area at the Mt. Mitchel parking area is really beautiful and we enjoyed a snack after our hike taking in the beautiful scenery! 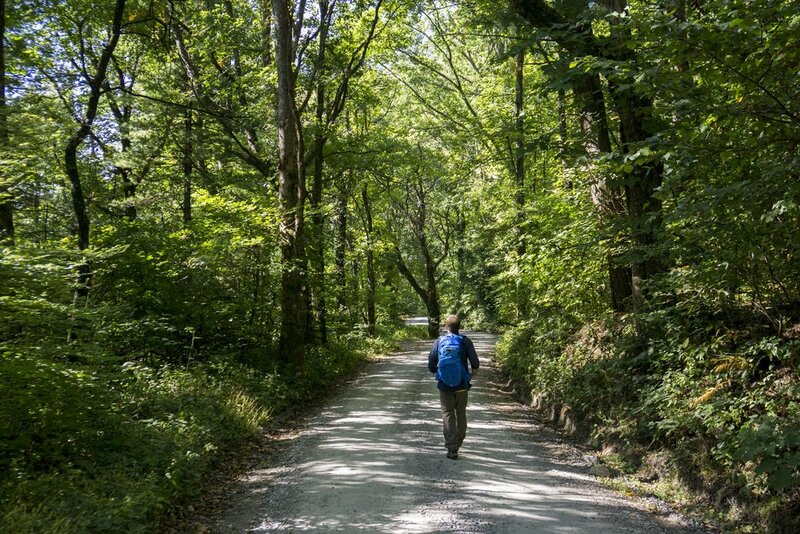 The Wildacres trail is a 7 mile loop that starts at Switzerland Inn. The trail starts off on the road for about 1 mile. The off-road trail is about 3 miles and is beautiful and quite easy. There is a short bit at the end that’s uphill. The off-road trail leads to the Blue Ridge Pkwy and the last 3 miles are on the road. Had we known that the last 3 miles would be on the road we may not have taken this trail, or may have backtracked part of the off-road trail. Grassy Creek Falls is a beautiful waterfall that’s about a mile from Switzerland Inn (2 miles roundtrip). The trail to the falls is quite easy, but it is uphill on the way back. 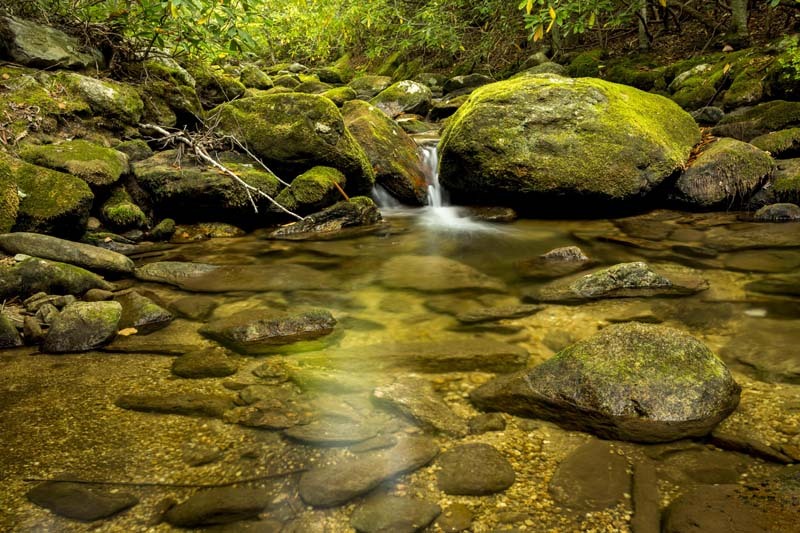 Grassy Creek Falls is a great place to sit for a while and enjoy nature. Crabtree Falls is around Blue Ridge Pkwy mile marker 309, about 6 miles from Little Switzerland. 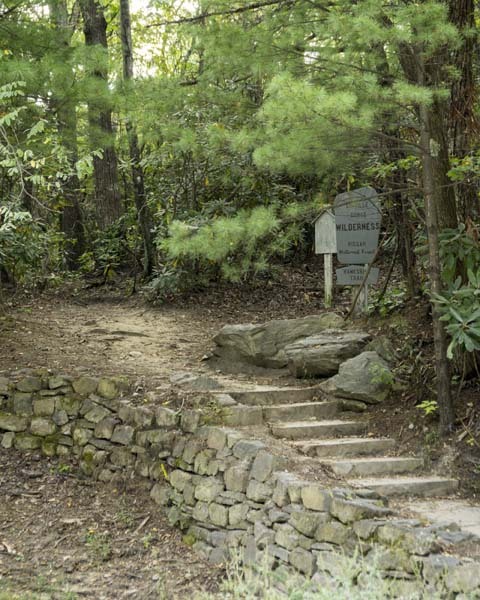 There is a Crabtree Falls Picnic area which includes clean washrooms, but the trailhead is not at the picnic area. Instead, the trailhead is at the campground which is about 1 mile away from the picnic area. There is plenty of parking at the campground, so park there for the hike. There are 2 trails to the falls: a 1.6 mile trail that winds around the ridge above the falls before the descent and a .6 mile trail that descends to the river valley. We chose the ridge trail on our way to the falls and the direct trail on our way back, which was a nice loop. The walk back up is strenuous, but totally worth it. Crabtree falls is 70 feet and very impressive. There are lots of rocks and places to relax and enjoy the experience. There are also several smaller falls on the ridge trail. This area has a lot of really great hikes… more than we had time for. One note of caution before setting out… the trailheads are off gravel roads that GPS might not pick up. In our descriptions we note the paved roads near the gravel roads, as we found it easiest to drop pins on our GPS to the nearest recognizable road and go from there. 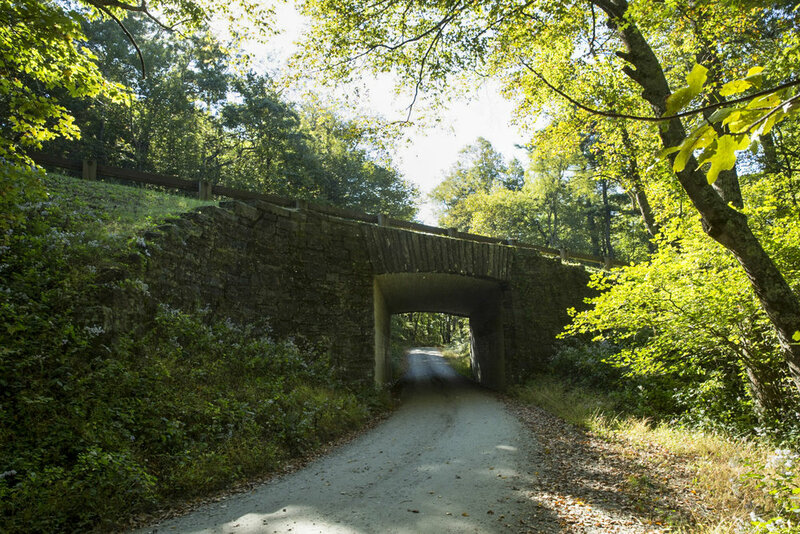 The nearest paved road to the Little Lost Cove trailhead is Brown Mountain Beach Road. Little Lost Cove trail ascents to a couple beautiful lookout points. We enjoyed sitting on huge rock formations and looking out at the surrounding mountains and the valley below. About 2 miles into the hike the Little Lost Cove trail meets the Harper Creek Falls trail, which leads to a beautiful waterfall. The waterfall isn’t very steep, and there are various places next to the falls to relax and enjoy. The Harper Creek Falls trail meanders through a beautiful forest with big trees, all kinds of moss, and a little river… it reminded us of a fairy tale forest. The total loop is about 4 miles with a little part at the end on the road to get back to the car (the road is gravel and not busy). The terrain and scenery change significantly throughout the loop, which keeps it interesting and very enjoyable. The gravel road leading to the Hawksbill trailhead begins at the end of Gingercake Rd. The trail is about 2 miles round trip (up and back). 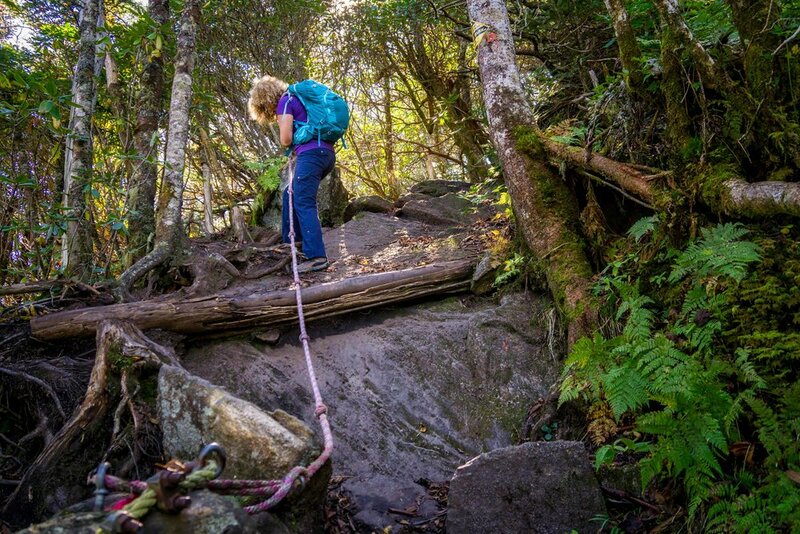 The ascent is pretty strenuous, but the Hawksbill is totally worth it. When we reached the top it was initially hard for us to see the Hawksbill rock formation… we had the “this is is?” feeling. We found a narrow path through some rocks and trees that leads to an amazing lookout and the Hawksbill. It was so interesting that we lost track of time and probably spent about an hour up there taking pictures and enjoying the scenery! The gravel road leading to the Spruce Tree trailhead and the Table Rock picnic area begins at the end of Gingercake Rd. Table Rock is accessible via a short walk at the picnic area or a 3.6 mile loop. This was our last hike of the trip and we intended to do the 3.6 mile loop that begins at the Spruce Tree trailhead… the hike didn’t go as intended! About .4 mile into the Spruce Tree trail there’s a split… we read the directions incorrectly and instead of going towards Table Rock we followed the Spruce Tree trail about 1.5 miles down to the Linville River valley! We learned a big lesson here… we knew it didn’t reel right to continue to descent, but we kept charging ahead. When we finally stopped and realized that we made a big mistake we had to walk all the way back up... we had a lot of time to think about not making that mistake again! We never made it to Table Rock… by the time we got to the split it was too late to do the entire loop and going to the picnic area to view Table Rock just didn’t feel right. This will be our first hike the next time we visit the area! 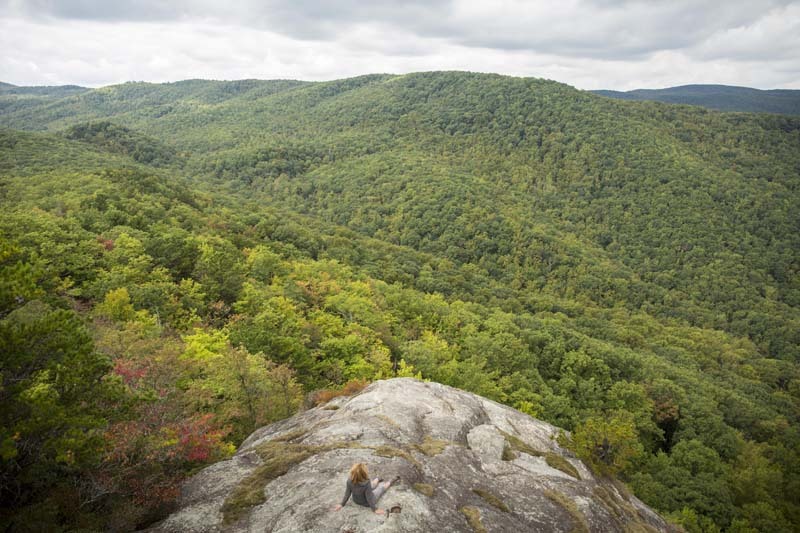 On a side note, the Linville River valley is pretty cool… lots of big rock formations, beautiful trees, and enough a break in the mountains that there’s lots of sun. We met some other hikers and learned that there are some other great trails out of the valley that we look forward to checking out. 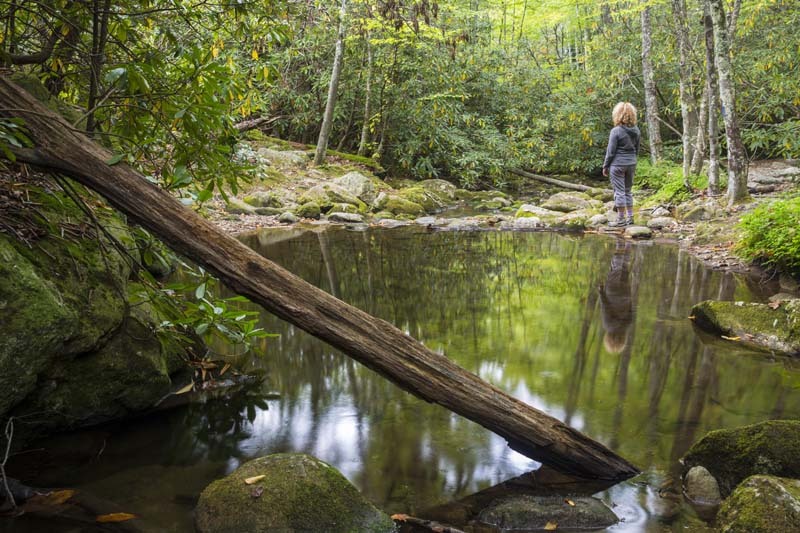 Looking back on our hikes we agree that North Carolina’s Blue Ridge Mountains are a hiker’s paradise! We will be back! Older PostAmish Country... A Great Fall Weekend Spot!